If you have shopped the Nordstrom Anniversary Sale, then you have most likely noticed that things sold out FAST! In the past, Nordstrom has restocked items before the sale went live to the public. They did not do that this year for whatever reason, but there are some great items that are still available in the sale. And there are still a few items that I am clicking on multiple times throughout the day to see if returns are made and they do get restocked. Most of the items that sold out were women's clothing and shoes. There are still tons of amazing home and beauty products that are in stock, and there are still some great shoes and clothing options too. I'm sharing all of these with you today! Some of my favorite picks are in the collage below, and there are a ton more linked at the bottom of this post! You can click on any item in the collage to be taken directly to it on Nordstrom's site. I don't know how I missed this ruffle coat until yesterday, but it is GORGEOUS! I also missed this beautiful dress until my mom texted me about it the other day and told me that Us magazine chose it as their favorite dress of the N Sale! The grey sweater I linked comes in 6 colors and would be perfect to wear with leggings or skinny jeans when it cools down. And I think the blue top pictured above would be perfect for work. It comes in multiple colors too. I can't suggest the bottoms I included in the collage more. I have talked about my love for Zella leggings countless times, and Spanx leggings are a great investment too (especially while they are marked down!). 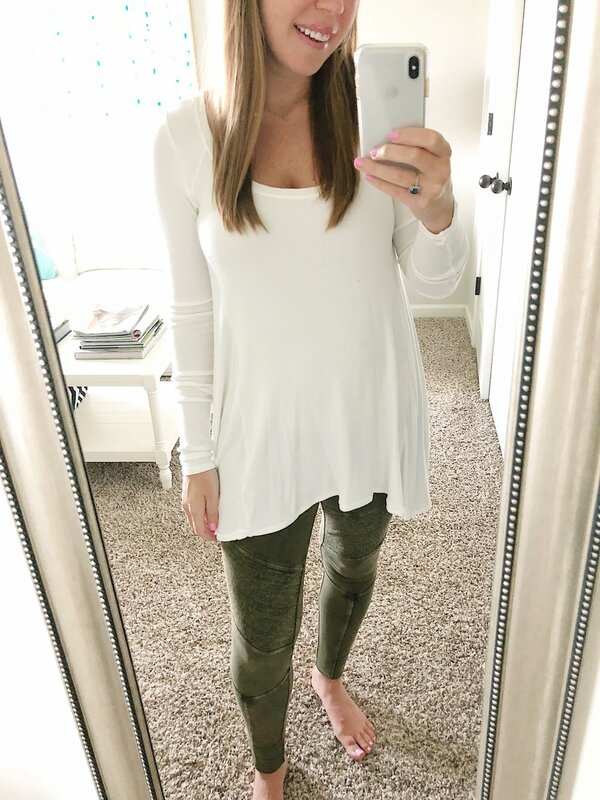 Zella cropped leggings and Zella maternity leggings are two items I check out everyday to see if they're back in stock. I purchased both of those things during Early Access, and I am hoping so hard they get restocked before the sale is over! I need some no show socks to wear with my pink Adidas running shoes, so I included these. My mom told me she got them and loves them! I have basically been living in the outfit pictured above. This pullover is SO comfy and the perfect length to wear with leggings! And you already know about my love for these Zella leggings and pink Adidias running shoes. One more outfit- this Free People top and these moto leggings have been two of the most purchased items from my blog during the sale. If either of them are in stock in your size, hurry and purchase! They are fabulous (and super comfy) closet staples! Thanks so much for reading!! Have a wonderful day! And I want to hear if you score any great deals!